ALL NATURE'S KISS PRODUCTS ARE FOR EXTERNAL USE ONLY! Use care when using this essential oil. Pregnant women should avoid use. Keep out of reach of children. Avoid contact with mucus membranes and eyes. If you have a medical condition or believe you may have a medical condition, consult with your licensed health care professional before using this product. Always dilute prior to applying topically. For use in aromatherapy and other applications. For all other applications carefully dilute this oils with a carrier oil. Examples of carrier oils are foraha, jojoba, grape seed, almond or olive oil. If you are unsure how to use this product, please refer to an essential oil book or other professional source for suggested usage and proper dilution methods. 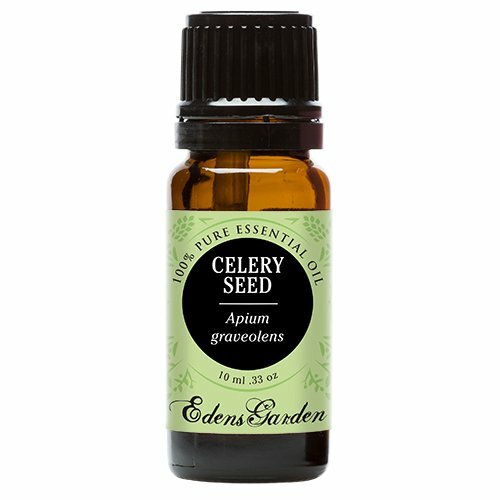 Nature's Kiss Celery Seed Essential Oil has a warm, spicy, sweet and long lasting aroma with a herbal fragrance. As an aromatic agent, it is used to make soaps and other body products. Aromatherapy Properties: (Uses) This essential Oil is used in bladder and kidney complaints, digestive upsets, and menstrual problems; the leaves are used in skin ailments. It is known to increase the elimination of uric acid and is useful for gout, neuralgia, and rheumatoid. A remedy for hepatobiliary disorders, it has been found to have a regenerating effect on the liver. This oil is also used for Used rheumatoid arthritis with mental depression. in tonic, and carminative preparations, and as a fragrance component in soaps, detergents, cosmetics and perfumes. Extensively used as a flavoring agent in foods, especially by the spice industry, and in alcoholic and soft drinks.Blends well with: Lavender 40/42, Tea Tree, Pine White, and Opoponax Wild Crafted. 100% Pure Therapeutic Grade Celery Seed 10ml Essential Oil Botanical Name: Apium graveolens Comes in 10ml amber glass essential oil bottle. European Dropper Cap included Celery Seed Essential Oil has a warm, sweet eathy aroma. What sets Healing Solutions Essential Oils apart is superior cultivation of ingredients that are the best in the world. Combined with superior distillation and bottling care process, We GUARANTEE that our oils are aromatically superior and more effective than any other oils - if you disagree we will refund your money! The Leading Aromatherapy Associations (Alliance of International Aromatherapists (AIA), International Aromatherapy and Aromatic Medicine Association, Aromatherapy Trade Council, and others) all state that essential oils should not be taken internally (regardless of purity or organic origin) unless under the guidance of a health care practitioner trained at an appropriate level . As such, all of our oils carry a label warning that the product is NOT FOR INTERNAL USE. 100% Pure Therapeutic Grade Celery Seed Essential Oil Comes in a 60ml amber glass essential oil bottle. European Dropper Cap included. What sets Healing Solutions Essential Oils apart is superior cultivation of ingredients that are the best in the world. Combined with superior distillation and bottling care process, We GUARANTEE that our oils are aromatically superior and more effective than any other oils - if you disagree we will refund your money! The Leading Aromatherapy Associations (Alliance of International Aromatherapists (AIA), International Aromatherapy and Aromatic Medicine Association, Aromatherapy Trade Council, and others) all state that essential oils should not be taken internally (regardless of purity or organic origin) unless under the guidance of a health care practitioner trained at an appropriate level . As such, all of our oils carry a label warning that the product is NOT FOR INTERNAL USE. 100% Pure Therapeutic Grade Celery Seed Essential Oil Comes in a 30ml amber glass essential oil bottle. European Dropper Cap included. What sets Healing Solutions Essential Oils apart is superior cultivation of ingredients that are the best in the world. Combined with superior distillation and bottling care process, We GUARANTEE that our oils are aromatically superior and more effective than any other oils - if you disagree we will refund your money! The Leading Aromatherapy Associations (Alliance of International Aromatherapists (AIA), International Aromatherapy and Aromatic Medicine Association, Aromatherapy Trade Council, and others) all state that essential oils should not be taken internally (regardless of purity or organic origin) unless under the guidance of a health care practitioner trained at an appropriate level . As such, all of our oils carry a label warning that the product is NOT FOR INTERNAL USE. Silky Scents EO96-5ML Celery Seed Essential Oil 100 Percent Pure Therapeutic Grade - 5 ml. Aromatherapy Properties: (Uses) This essential Oil is used in bladder and kidney complaints digestive upsets and menstrual problems; the leaves are used in skin ailments. It is known to increase the elimination of uric acid and is useful for gout neuralgia and rheumatoid. A remedy for hepatobiliary disorders it has been found to have a regenerating effect on the liver. This oil is also used for Used rheumatoid arthritis with mental depression. in tonicand carminative preparations and as a fragrance component in soaps detergents cosmetics and perfumes. Extensively used as a flavoring agent in foods especially by the spice industry and in alcoholic and soft drinks. Blends well with: Lavender 40/42 Tea Tree Pine White and Opoponax Wild Crafted. 100% Pure Essential Oil Capacity - 5 ml. Silky Scents EO96-1OZ-30ML Celery Seed Essential Oil 100 Percent Pure Therapeutic Grade - 30 ml. Aromatherapy Properties: (Uses) This essential Oil is used in bladder and kidney complaints digestive upsets and menstrual problems; the leaves are used in skin ailments. It is known to increase the elimination of uric acid and is useful for gout neuralgia and rheumatoid. A remedy for hepatobiliary disorders it has been found to have a regenerating effect on the liver. This oil is also used for Used rheumatoid arthritis with mental depression. in tonicand carminative preparations and as a fragrance component in soaps detergents cosmetics and perfumes. Extensively used as a flavoring agent in foods especially by the spice industry and in alcoholic and soft drinks. Blends well with: Lavender 40/42 Tea Tree Pine White and Opoponax Wild Crafted. 100% Pure Essential Oil Capacity - 30 ml. Silky Scents EO96-10ML Celery Seed Essential Oil 100 Percent Pure Therapeutic Grade - 10 ml. Aromatherapy Properties: (Uses) This essential Oil is used in bladder and kidney complaints digestive upsets and menstrual problems; the leaves are used in skin ailments. It is known to increase the elimination of uric acid and is useful for gout neuralgia and rheumatoid. A remedy for hepatobiliary disorders it has been found to have a regenerating effect on the liver. This oil is also used for Used rheumatoid arthritis with mental depression. in tonicand carminative preparations and as a fragrance component in soaps detergents cosmetics and perfumes. Extensively used as a flavoring agent in foods especially by the spice industry and in alcoholic and soft drinks. Blends well with: Lavender 40/42 Tea Tree Pine White and Opoponax Wild Crafted. 100% Pure Essential Oil Capacity - 10 ml. Silky Scents EO96-5ML Celery Seed Essential Oil, 100 Percent Pure Therapeutic Grade - 5 ml. Silky Scents EO96-15ML Celery Seed Essential Oil 100 Percent Pure Therapeutic Grade - 15 ml. Aromatherapy Properties: (Uses) This essential Oil is used in bladder and kidney complaints digestive upsets and menstrual problems; the leaves are used in skin ailments. It is known to increase the elimination of uric acid and is useful for gout neuralgia and rheumatoid. A remedy for hepatobiliary disorders it has been found to have a regenerating effect on the liver. This oil is also used for Used rheumatoid arthritis with mental depression. in tonicand carminative preparations and as a fragrance component in soaps detergents cosmetics and perfumes. Extensively used as a flavoring agent in foods especially by the spice industry and in alcoholic and soft drinks. Blends well with: Lavender 40/42 Tea Tree Pine White and Opoponax Wild Crafted. 100% Pure Essential Oil Capacity - 15 ml. Silky Scents EO96-15ML Celery Seed Essential Oil, 100 Percent Pure Therapeutic Grade - 15 ml. Silky Scents EO96-1OZ-30ML Celery Seed Essential Oil, 100 Percent Pure Therapeutic Grade - 30 ml.